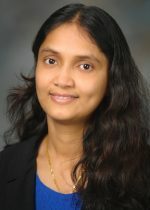 Dr. Sunila Pradeep is an Assistant Professor in Obstetrics and Gynecology at the Medical college of Wisconsin. Dr. Pradeep completed her Ph.D. from India where she focused on developing novel immunomodulatory and anti-angiogenic agents in cancer models. She then joined Weizmann Institute of Science in Israel for her postdoctoral research where she continued research on discovering novel anti-angiogenic compounds. To translate her research into ovarian cancer, she joined Dr. Anil Sood’s lab in the Departments of Gynecology Oncology and Cancer Biology at M.D. Anderson. In the Sood lab, she used innovative mouse models to address questions related to ovarian cancer metastasis. Her studies demonstrated that ovarian cancer cells metastasize hematogenously as an alternative route of metastasis (Cancer Cell, 2014). She further showed that EphrinB4 (EphB4) rather than the canonical Erythropoietin (Epo) receptor, is the critical mediator of erythropoietin-induced tumor progression. This work suggests a novel alternate dimension to the biology of erythropoietin (Cancer Cell in 2015). In her most recent studies, she has evaluated the potential role of immune cells in the development of adaptive resistance to anti-vascular endothelial growth factor (VEGF) therapy, which was recently accepted in Clinical Cancer Research journal. In addition to these publications, she is an author or co-author of more than 50 papers in respected cancer and basic science journals. Dr. Pradeep has received numerous awards including the New York Ovarian Cancer Synergy grant from the Foundation for Women’s Cancer Research, AACR Marsha Rivkin Scholar-In-Training Award, and a Trainee Research Award from MD Anderson. Dr. Pradeep’s research interest is centered on identifying the immune population that facilitate the early omental metastasis in ovarian cancer. She has extensive experience in live mice surgeries to understand the early events during ovarian cancer metastasis. Her work was also recognized by Liz Tilberis, Early Career Development Award, OCRFA.